Talent Management isn't just a fancy term for skillfull employees, but rather an overall commitment to reach, develop, and inspire the most talented employees in the job market. Managing talent is also part of a larger business strategy that includes creating a better workforce as a whole. 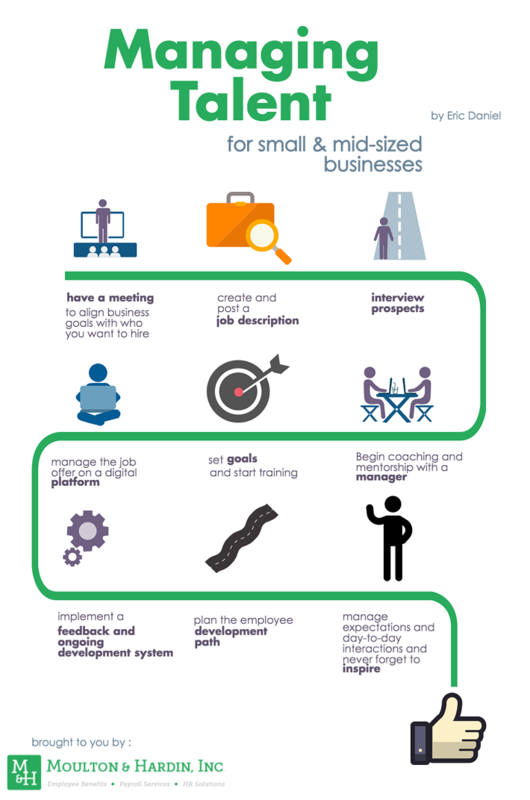 In large companies, only the top performers may be entered into such a system, but most small to mid-sized businesses include all their employees in this process. What does Talent Management look like? You may be surprised to find coaching, mentorship, and path planning in a conversation about talent management, but these components are essential to personal and employee development. Mentoring pays. 71% of Fortune 500 companies offer some type of mentoring program, and employees report that an opportunity for learning and development trump company culture and even (to a point) compensation. Part of your career guidance should come in the form of creating a feedback system. If your employee has expectations set before her, and you let her know what's working and what isn't, she will have a much better understanding of how to direct talent to its best use. In terms of presenting your feedback, be positive. You don't have to play hardball, and you also don't have to sugarcoat information. Collect and sort employee feedback in one place that is easy to access. Keeping a comprehensive log of qualitative and quantitative employee performance will make your decision-making easier. Several emerging platforms are equipped to make this process easier. No matter the size of your company or the nature of its culture, you still want to make the best our of your employees. The benefits of managing their talent is only just being realized as people adopt mentorship programs and comprehensive digital systems that track necessary aspects of HR. To learn more about ways you can effectively manage your talent, contact us!